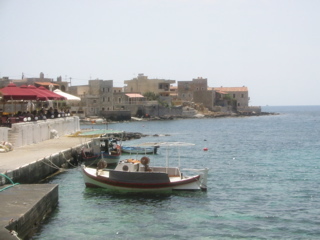 We spent a day touring the Mani peninsula. 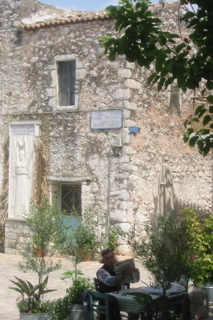 The photo at left shows the town of Vatheia, whose architecture is typical of the area. Note the many stone towers, ideal for defense. The people of the Mani have always been so rugged and fiercely independent that this area was the only part of Greece that the Turkish empire only contained, but never actually controlled. Our guide Colin told terrific stories about local Greek resistance to Turkish occupation and about Patrick Leigh Fermor, a World War II British special-forces paratrooper who was dropped in the area to help organize the resistance and who still lives and writes there today. We visited Areopoli, the birthplace of the modern Greek effort to overthrow the Turkish occupation. On the right is the modest monument to this effort. We enjoyed a quiet snack at the cafe in the foreground, and met the friendly owner of the cafe, who was also our waiter. There is something wonderful about sitting in a quiet spot and watching the world go by. 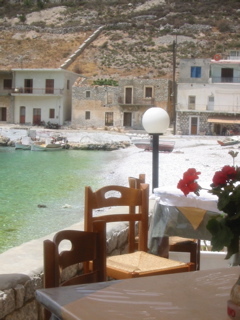 We stopped for lunch in Gerolimenas at a cafe right next to the beach and a group of small fishing boats. We ate with our fun new friends Penny and Troy, who were on the tour with us. Afterwards, we strolled through the town to find ice cream together, then sat on the beach and skipped stones.